ANCHORAGE, AK -- The oldest son of former Alaska Gov. Sarah Palin was arrested in a domestic violence case in which his girlfriend was afraid he would shoot himself with an AR-15 assault rifle, according to court documents filed Tuesday. Track Palin, 26, is charged with assault, interfering with the report of a domestic violence crime and possessing a weapon while intoxicated in connection with the incident Monday night at the Wasilla home of his parents, where he lives, according to an affidavit by police. The girlfriend told authorities she was punched in the face by Palin, who is the oldest child of Sarah Palin, the 2008 Republican vice presidential nominee and conservative leader. The charges were filed Tuesday, the same day Sarah Palin endorsed Republican presidential front-runner Donald Trump before voting begins with the Iowa caucuses. There is no telephone listing for the girlfriend. The court documents say the woman, Track Palin's girlfriend of one year, had bruising and swelling around her left eye, and she said her right knee hurt after Palin kicked her there. Palin family attorney John Tiemessen declined to comment on the matter other than to say in an email that respect for the family's privacy is appreciated "as Track receives the help that he and many of our returning veterans need." Palin's arraignment was held Tuesday, but Tiemessen was not sure if he entered a plea yet. Track Palin spent a year deployed in Iraq with the Army. When his mother was the GOP vice-presidential candidate in 2008, she spoke at her son's deployment ceremony in Fairbanks, one of the few trips back to Alaska while on the campaign trail that fall. 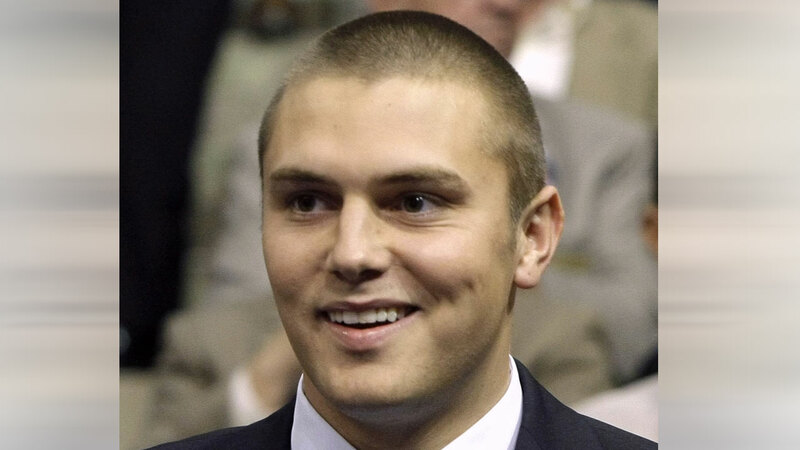 Track Palin enlisted in the Army on the sixth anniversary of the Sept. 11, 2001, terrorist attacks. According to the three-page affidavit, both Palin and his girlfriend called 911 that night. Police Officer Andrew Kappler wrote that he arrived at the Wasilla home and found Track Palin walking outside and talking on a phone. The officer said Palin had an injury to his right eye and surrounding area, smelled strongly of alcohol and acted with escalating hostility, prompting Kappler to put him in handcuffs. Police say a breath sample provided by Palin showed he had a blood alcohol level of 0.189. The affidavit says other officers found the girlfriend hiding under a bed inside the home and crying. The argument continued at the home, according to the affidavit, which says Palin struck the woman with his fist on the left side of her head near her eye. She curled up in the fetal position because she didn't know what else he would do, the woman told police. She said he then kicked her in the knee and threw her phone across the driveway, according to the court document. The woman said she went inside after getting her phone. Inside, Palin held the rifle, with the barrel just away from his face pointed to the side, the affidavit states. The affidavit adds that the woman told police Palin was yelling "Do you think I won't do it?" The girlfriend "was concerned that he would shoot himself and ran outside and around the house," the affidavit says. "She didn't see where Palin went, so she went inside and up the stairs, where she hid under a bed." It's not the first encounter with the law for Palin or other members of his family. In September 2014, he and other Palins were involved in a brawl that broke out at a party in Anchorage. No arrests were made in the melee, and no one wanted to press charges. But according to a police report, Palin had blood around his mouth and his hands. He was belligerent until his mother told him to talk to a police officer.